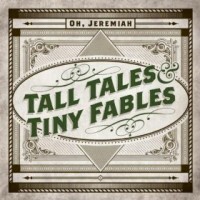 Oh, Jeremiah: "Tall Tales & Tiny Fables"
The EP features clean acoustic guitars, weeping strings and a beautifully constructed rhythm section—complete with ear-catching vocals filled with passion and genuine vulnerability. Songs like “Better Man” and “Happy Now” are perfect examples of Jeremiah’s stories of acknowledging defenselessness for a period of time but ultimately digging yourself out. Oh, Jeremiah justly brings bliss and beauty to the listener’s ear through song, from start to finish Tall Tales & Tiny Fables will truly pick at the blood pulsing through your heart with written song and experience that surely anyone can relate to. Whether you enjoy clapping, shaking, singing or just hollering—you will surely enjoy the homegrown Americana found on Tall Tales & Tiny Fables. So gather and sing along in communion with friends and strangers alike because Oh, Jeremiah is coming to a scene, barnyard, or dive bar near you!